Living in a Hard Water Region? By knowing the recent history of your water and the length of time it has been in contact with soil and rock, it is possible to predict its quality. In the Lake District and most areas of Scotland, the water is soft because it is mainly drawn out of surface water and the contact time between water and earth is short. Additionally, there is not much chalk in the soil to be dissolved. In the South East of England, there is a lot of chalk and much of the water is pumped from underground where there has been a longer contact time, hence, the water is hard. The quality of water in the British Isles is normally good, but it must be remembered that the only statutory obligation on the Water Authorities is to supply water fit for potable (drinking) use. This puts no obligation on water authorities to be concerned in any way about the hardness of the water. Hard water can be potentially corrosive and damaging to domestic appliances, pipework and central heating boilers.As the map indicates, the water in the central, eastern and southern areas of England is hardest. 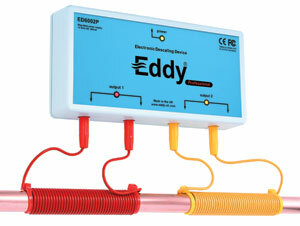 The Eddy electronic water descaler requires no plumbing and can be fitted in minutes. It offers a real alternative to a water softener at a fraction of the price. In the vast majority of cases it removes the everyday nuisance of limescale - or your money back - with absolutely no quibble. We can afford to do this because hardly any get returned. Thousands of happy customers over 14 years.